« How to wish a happy new year 0x7DB! The procedure I’m gonna explain is mainly a remainder to myself. But first of all a little introduction. * An Oak Technology Mozart Sound System 16 bit, Sound Blaster Pro compatible. The way to install the driver files for a Sound Blaster card under MS-DOS, although not really easy, was more or less standard. Launching a setup ( the easy part ), followed by some tweaking of the autoexec.bat and config.sys files ( the complicated part ) and hopefully nothing more. Under Windows, things became a little more complicated and with the begin of the PnP ( actually, that means PLUG and PRAY ) era, things got even more complicated. The final user is unaware of this because, over the time, setup programs became “smarter” and got the job ( installing the drivers and configuring the operating system ) done well almost always. That simply means sometimes they fail. 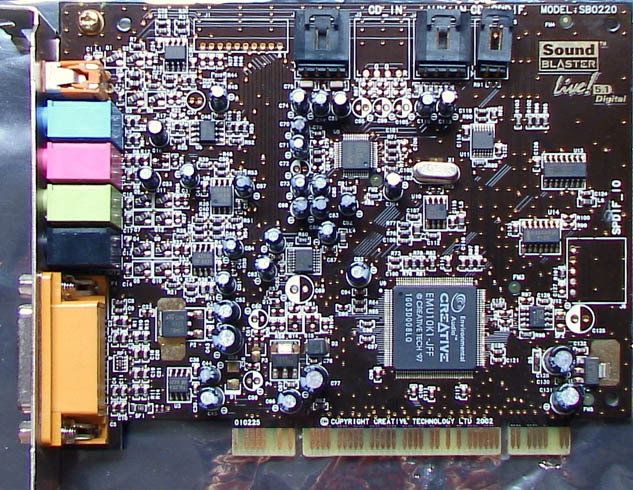 Some days ago, I had to install a Creative Sound Blaster Live! 5.1 Digital into Eagle, my 2.66 GHz Pentium 4 HT. Eagle already has an integrated audio chip, which works, but is not powerful enough for some tasks and doesn’t support ASIO drivers very well. The SB Live! 5.1 instead is built around the EMU10K1 audio processor that, ten years ago, was one of the most powerful audio processors on the market and was used also on semi-professional equipment, so the decision to put the SB Live! 5.1 into Eagle was rather straightforward. As I wrote, just above, sometimes the drivers setup programs fail. Needless to say that this setup fails just at the beginning. The setup downloaded from the Creative support website, LiveDrvUni-Pack_ENG.exe, usually fails to locate the SB Live! installed into the system and quit without doing anything. Although is an executable, actually is a self expanding archive that can be opened, for example, using WinZip. Inside the audio\drivers directory there are some files that should be the drivers needed to use the card with Windows NT 5.x. But using the Windows wizard to install the drivers doesn’t work for me as the OS tells that drivers for the device can’t be located in the folder… in which they actually are. So I launched ctzapxx.exe, and that seemed to work, but the system failed to reboot ( Windows XP hanged during shutdown ). At the next boot, no drivers were installed in the system. The solution was to launch ctzapxx.exe and, when asked to reboot the system, power-off the system using the switch of the power supply. At the next boot, drivers were installed and working.